Poor attic ventilation makes your air conditioner work harder, leads to condensation in the attic, and reduces the lifespan of your roof. Fortunately, there are numerous ways to improve attic ventilation, some of which are quite inexpensive and manageable DIY projects. All efforts at attic ventilation make use of the fact that hot air rises. The goal is to allow hot air to escape from the top of the roof, which is greatly aided if measures are taken to allow cooler air to enter from below. Many options for improving attic ventilation encourage the natural flow of hot air toward the top of the roof and out in some way. Fans, whether solar or electric, are another option. General recommendations are to have one square foot of vent space per 150 square feet of attic space. The vent allowance should be evenly split between intake vents at the bottom of the roof and exhaust vents near the top of the roof and should be evenly distributed in both areas. 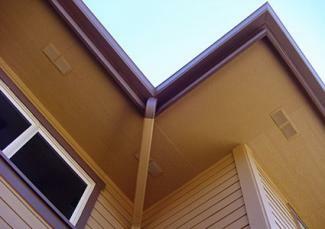 Intake vents are typically found along the soffit of the house, which is the horizontal wood surface under the eaves. These improve attic ventilation by creating a draft of air coming into the attic from outside at the lowest possible location on the roof. These are very popular because they can be installed in a matter of minutes. Rectangular soffit vents are typically 8 x 16 inches and should be installed parallel to the length of the soffit and centered on the width of the soffit. The vent openings should be angled toward the house. Installing rectangular soffit vents is as easy as marking the hole, cutting it with a jig saw and nailing or screwing the vent into place. A one-inch pilot hole should be drilled through the plywood first to create a space for the jig saw blade to start cutting. The hole should be a rectangle that is 1/2-inch smaller than the size of the vent on all sides. Alternatively, you can use the pilot hole to measure the thickness of the plywood and then set the blade on a circular saw to that depth and use it to cut the whole. This method is useful where the vent spans a roof rafter - the shallow setting on the blade allows only the plywood to be cut, leaving the rafter intact. These run the entire length of the soffit, greatly increasing the amount air flow coming into the attic. Continuous soffit vents are an alternative to individual rectangular vents, but they share a similar installation process. Cut out a continuous strip of the soffit from one end of the roof to the other using a circular saw. Stop an inch or two before the end of the soffit and use a chisel to join the two cuts. Pry out the plywood strip from where it is nailed to the rafters and hammer or screw the vent into place. Continuous soffit vents generally come in eight-foot sections, but you will likely have to cut the last one to size with tin snips. The issue with soffit vents is that insulation in between the rafters often blocks air flowing into them, which usually means venturing into the attic to do something about it. One option is to simply pull back the insulation with a rake or hoe. However, there are also baffles that permanently hold the insulation off of the roof to allow air to flow in from the vent and up. These are nothing more than a piece of molded plastic, or even cardboard, that is shoved down between the insulation and the roof toward the vent and nailed or screwed into the roof. The necessary complement to intake vents is exhaust vents. These improve attic ventilation by releasing the air sucked in through the soffit vents out of the top of the roof, creating a continuous flow of air. 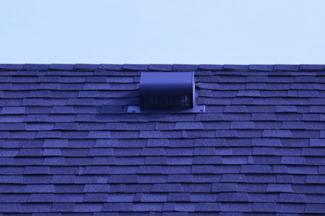 These are installed as close as possible to the ridge line of the house. They are very effective at dispelling hot air though some people consider them unattractive. There are spherical models that actually have lightweight fan blades inside that are propelled by the wind to increase the flow of the air exiting the vent and there are square models with a lower profile that are less visually obtrusive. Both are installed in a similar manner. From inside the attic, drive a nail through the roof at the midpoint between the rafters where each roof vent will be located. This will mark the location on the outside of the roof, ensuring that the hole is not cut over a rafter. 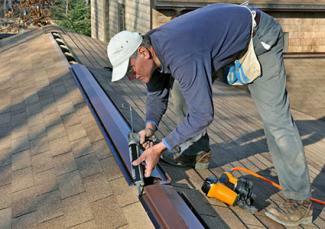 Mark the shape of the vent opening on the roof and use a utility knife to cut through the shingles. Use a jigsaw to cut through the plywood. Apply roof cement to the underside of the horizontal flange of the roof vent and slide the top of the flange under the shingles above the opening. Secure the vent to the roof with nails or screws and add a bead of roof cement along the edge between the vent and the shingles. Ridge vents are to roof vents as continuous soffit vents are to rectangular soffit vents - they provide the maximum possible ventilation. Because they involve cutting open the entire length of the ridge of the roof, this project should be planned carefully to avoid coinciding with rain and should only be attempted if you are confident in your DIY abilities. Remove the existing ridge cap shingles before you begin. 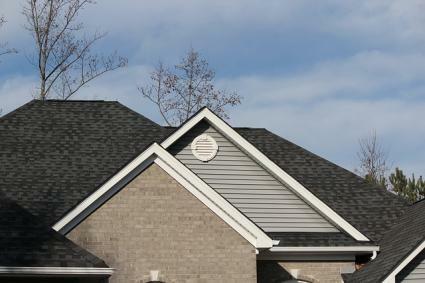 Ridge vents vary in width, but you will need to cut a narrow strip of the roof on either side of the peak. This will typically be about three inches wide, but check the specifications that came with the ridge cap. Mark the lines with a chalk line so they are perfectly parallel and equidistant from the roof peak. The cut should end at least six inches before the roof ridge goes over the outer wall of the house and extends over the eaves so the vent is over the attic space only. Set the depth of the circular saw blade to the thickness of the plywood to avoid cutting into the rafters. After making the cuts, pry up the plywood and any nails that are sticking out. Center the ridge vent over the opening and secure it to the roof using screws or nails. Cover the ridge vent with ridge cap shingles, securing them with roofing nails. Continue the ridge cap shingles past the ends of the vent and onto the ridge peak, overlapping them so they will shed water away from the vent. Dab roofing cement onto the all the nail heads to waterproof them. 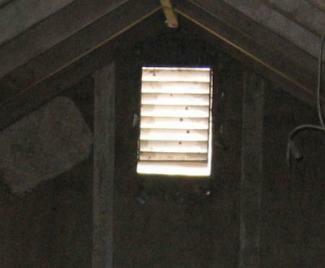 These go in the triangular space under the gables on either end of the house. They are easier to install than roof vents and ridge vents because there are typically no shingles to deal with and less of a concern with waterproofing since they are on a vertical surface. But alone they are unlikely to meet the square footage requirements to ventilate the attic adequately. They are a good addition to complement roof vents, however. Set the blade depth of a circular saw to correspond to the thickness of the siding under the gable. Mark the siding according to the size and shape of the vent, make the cuts and pry the siding off of the studs. Position the vent and nail or screw it into place. Apply a bead of caulk where the vent meets the surrounding siding. A combination of intake and exhaust vents utilizes natural forces to move hot air out of the house and avoid condensation. However, electric or solar-powered fans can greatly improve ventilation performance. 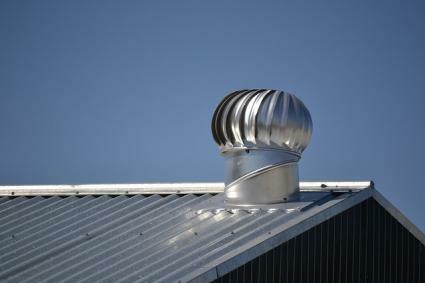 These can be installed in conjunction with roof vents or gable vents. They can be purchased as a unit combined with the vent or added on separately to an existing vent. Fans are always installed inside the attic space where they are protected from the elements. The downside of adding fans is not only the additional cost of the fans, but the monthly cost of electricity to operate them. Also, it is usually necessary for a licensed electrician to connect the fan to the household wiring. Always wear safety goggles, a dust mask and ear protection when cutting into the roof or soffit. It is hard to avoid hitting nails and pieces of shingle can easily be propelled through the air by the saw. When working with insulation in the attic, wear a respirator and protective clothing. Lung or skin contact with insulation can cause severe irritation. Attic spaces and rooftops can be well over 100 degrees in summer so avoid working in these areas during the hottest times of year or schedule your work in the early morning. Improving attic ventilation usually involves working on ladders as well as the roof. Do the work in dry weather only and use appropriate safety devices, such as ladder stabilizers and roof safety harnesses. Most attics have some form of ventilation from when the house was built, but it can often be improved on. The more air flow you can provide, the cooler the house will be and the longer the roof will last.